The US-based agency BBMG was the first to apply the term “conscious” to consumers in its 2009 Conscious Consumer Report. 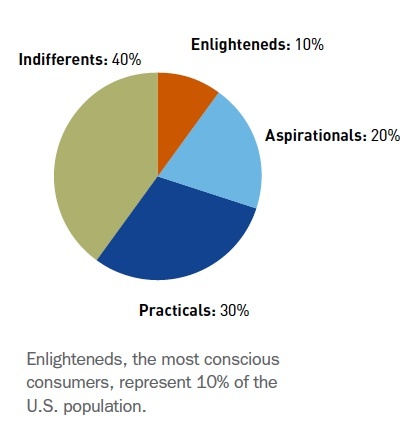 Their findings showed that while as many as 90% of Americans say the words “conscious consumer” describe them very well, 30% of the US population – some 70 million consumers — are values-aspirational, practical purchasers who are constantly looking to align their actions with their ideals; even though tight budgets and time constraints often require them to make practical trade-offs. The same research found that these new consumers were twice as likely to reward, punish or influence others based on company practices and then blog, post, rate or review products or services. While these conscious consumers may still be a minority, their affluence, education and proclivity for advocacy and community, suggest that what this passionate 30% does today will shape what the mainstream does tomorrow.